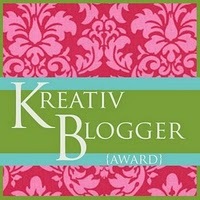 Brownbugz over at a ladybug’s life has given me the Kreative blogger award. This is the first award I have gotten for this blog. I am supposed to tell 10 things about myself that you probably don’t know. Normally I write these kinds of things on my welcome to me blog. That’s more my random life type of blog and this is just about cooking and baking. So, to keep in line with this blog, my 10 things will center around food and cooking. 1. The first thing I cooked all by myself was spanish rice. I didn’t know I was supposed to turn it down and the bottom scorched. It wasn’t good, but my dad ate it without saying a word. I was 11. 2. The only fats/oils I cook with are butter,extra virgin olive oil, grape seed oil, and virgin coconut oil- all organic. 3. I am hit and miss when it comes to decorating cakes. Sometimes it looks great. Other times, it looks like a 2 year old was given a pastry bag. 4. I have a huge cookbook collection. I have to keep some in a big tote because I have nowhere to keep them. 5. When I grill out, I will cook as much of the meal as I can on it. Meat, veggies, bread- everything is better cooked on the grill. Charcoal all the way! 6. If I find a recipe that sounds good, but starts with a mix, I will either modify it or not make it. 7. I love making jams and jellies. They are so easy. And yummy! You can start off with frozen fruit or bottled juice if you need to. 8. I made my own venison summer sausage last Christmas. It tasted good, but was not as nicely shaped as the ones you buy. 9. My favorite pudding is butterscotch and it needs to be warm. 10. I have a marble slab that I roll my pastry out on. My husband bought it for me for Christmas many years ago. I love it. Now, I am to pass this on to 6 other bloggers. Please check all these bloggers out.